Smooth Gold Filled Cap with gold filled clip. No pattern except two etched lines for a cap band. Gold content up by the clip. Found with aluminum jewels. The original finish on these caps was a brushed finish, and then lacquered, leaving the space within the two etched lines shiny. The finish did not last long and the caps acquired a shiny finish throughout. A second version is found with gold content at the bottom, underneath the etched band. Smooth Gold Filled Cap with gold filled clip. No pattern except two etched lines for a cap band. Gold content underneath the etched band. Found with aluminum jewel. The original finish on these caps was a brushed finish, and then lacquered, leaving the space within the two etched lines shiny. The finish did not last long and the caps acquired a shiny finish throughout. A second version is found with gold content at top near the clip. Smooth Gold Filled Cap with gold filled clip. No pattern except one etched line for a cap band. Gold content up by the clip. Found with aluminum jewels. 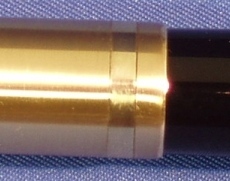 Gold filled cap with smooth finish and paralell lines band etched near cap lip. Marked at top of cap with GF content. Aluminum jewel. The original finish on these caps was a brushed finish, and then lacquered, leaving the space within the band shiny. The finish did not last long and the caps acquired a shiny finish throughout. the top of the cap near the clip. Gold filled raised “Wedding Band” applied cap band, unique to first year caps. Aluminum jewels. The original finish on these caps was a brushed finish, and then lacquered, leaving the raised band with a shiny finish. The finish did not last long and the caps acquired a shiny finish throughout. Very hard to find the matching pencil. 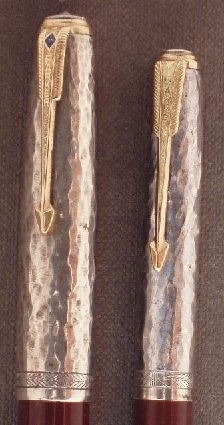 Hand hammered Sterling Silver caps with gold filled trim. First year caps. Aluminum jewels on pen and pencil. Both pieces are imprinted near the top of the clip with “Sterling Silver”. Not a cataloged item, available by special order only. Pencil is harder to find than the pen. This pattern is very often faked. First Year Cap Cap in Gold Filled with pink, yellow and white gold stripes, giving it a 3-color effect (sometimes called a “Watermelon” cap). Gold filled content imprint at top of cap. Gold filled raised “Wedding Band” applied cap band, unique to first year caps. Aluminum jewel. Lustraloy (stainless steel) Cap with band pattern of 7 lines, wide polished band, and 7 lines, with gold filled clip. Found on a red band filler pen dated 1946. Probably a model shop prototype cap. Gold filled Cap with unusual line pattern that does not go the whole lenght of the pen. Found on a red band demonstrator dated 1946. Probably a model shop prototype cap. Lustraloy (stainless steel) caps with chrome plated clips. These caps had a matte finish with a shiny cap band when new. Finish was more “brushed” than the later aerometric series caps. The finish did not stand up to wear too well and quickly wore off. This was a transition cap after the Blue Diamond guarantee was discontinued. Usually found in vacumatic “51” pens dated 1947-1948 and the early aerometric series pens of 1948-1949. Gold Filled Cap with gold filled clip, with pattern of closely spaced lines all around. 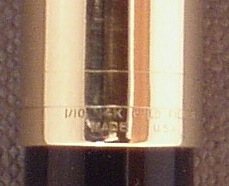 Note the “Parker” on the band, unlike the earlier Blue Diamond caps. Found on 1947 to 1948 Parker “51” vacumatic filler pens, single and double jewels. A previously unknown Solid Gold 14k cap with a smooth/no pattern finish and 14k clip. Before this cap was found, the smooth 14k solid gold caps had only been seen with the blue diamond clip. This cap has the plain arrow clip and “Parker” on the cap, which would make it correct. In addition, it has the normal tab under the clip, found in all plain arrow caps.